I’ve decided that in 2019 I’m going to start selling a bunch of my own work as sheet music and recordings on my website, davidechavez.com, and I’m going to donate 100% of the proceeds to organizations that help immigrants, migrants, and refugees get the resources they need to be healthy and safe. I’m also going to continue new music specifically about these topics and related issues. I need to do something. I firmly believe that, as many on the right-leaning side of the political spectrum might say, government is not the answer to all our problems. 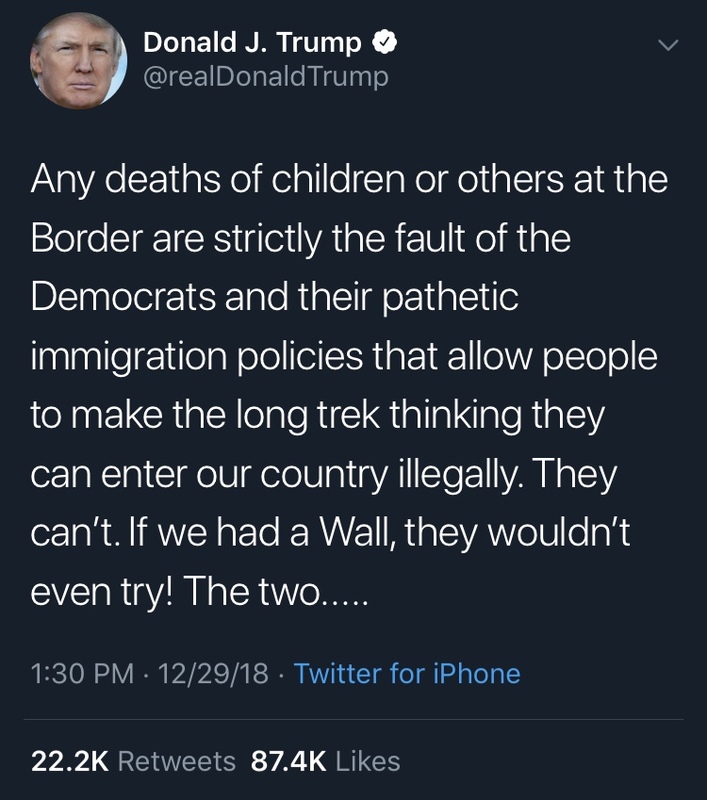 There are people not so different from you and me suffering and dying at our nation’s doorstep and our executive branch leader and command-in-chief very publicly writes/tweets/says things like he did today; he and many others fail to take action to prioritize human life and wellbeing above all. What the President tweeted is a truly horrid statement (see screenshot below). If this is your idea of a “culture of life,” then I don’t know what to tell you. Also, who are the 87,000+ people who hit “like” on this tweet in the last ten hours? What are they thinking? I hope many of them are actually bots. For those who aren’t, I feel sad that they find this statement acceptable or preferable in any way. In any case, I’m going to do what little I can to be the change I wish to see. I will share my creative work for the benefit of others who are less fortunate, foreign, different, forgotten, and in need. I’m going to go with Rev. Rob Lee (see screenshot below from yesterday) on how to respond to the needs at hand.